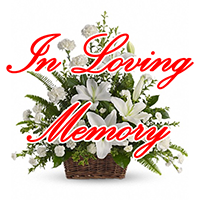 Donna J. Ridens, 76, born in Stamford, Texas passed away on Monday, January 28, 2019 in Palm Bay. She was a mortgage company Vice President. Donna will now join her husband of 54 years Hubert “Rusty” Ridens, Jr. She is survived by her son and daughter in law, Kevin and Michelle Ridens and grandchildren, Stephanie and Stevie. A private service will be held at Cape Canaveral National Cemetery. Donations may be made to the Wounded Warrior Project.